Cold Steel Norman Swords for sale are 37 ¼ inches in all and weigh 35.8 ounces. This Norman Sword is inspired by real medieval swords that were popular in the 11th century and wielded during the Norman Invasion of Britain. This modern version features a functional 30 inch 1055 high carbon steel blade that has a center fuller, sharp blade edges and a pointed tip. The 7 ¼ inch wooden grip is covered in real leather. These swords feature a modified cocked hat pommel. The genuine leather covered wooden scabbard has polished steel fittings. 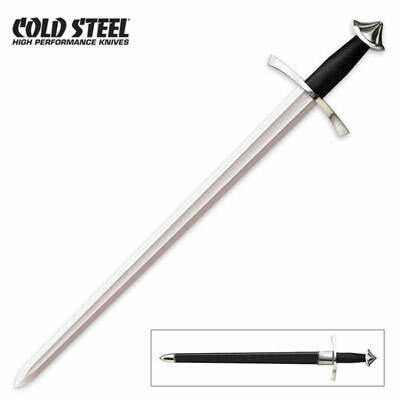 Buy the popular Cold Steel Norman Swords for $289.99.